Have you ever known a person that you enjoyed being around, despite that they always seem to try way too hard to be the center of attention? You may like them as an individual, but wish that they would just tone it down, if only a little bit? 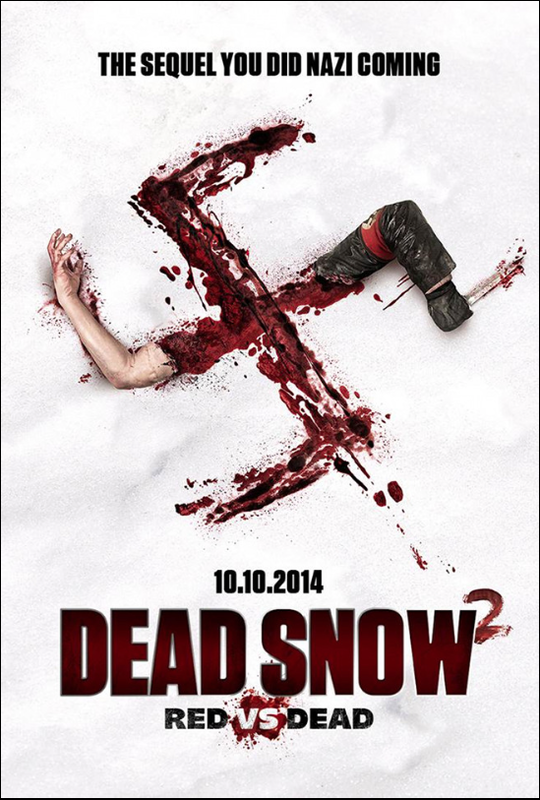 Well, Tommy Wirkola‘s Dead Snow 2: Red Vs. Dead is the movie version of that friend. The first Dead Snow was a pretty enjoyable horror movie and tribute to directors like George Romero, Sam Raimi, and John Carpenter (especially Carpenter, seeing that it was essentially a gorier, more humorous version of his 1979 movie, The Fog). Unfortunately, the sequel tries way too hard, upping the ante by throwing in an evil arm (very Sam Raimi), and a troop of Russian zombies on top of the Nazi zombies that were raising Hell from the first movie. But sometimes more isn’t better, it’s just more. In fact, when things really get moving you have to be amazed that he can even wrangle it all. Despite the similarities to The Fog, it actually plays more like a Sam Raimi movie–as opposed to something from John Carpenter, who takes his subject matter more seriously–who’s likely to mine horror for humor as much as violence. Though there’s an important caveat: When Raimi tends to do so the humor acts as a release valve (for tension), while in Wirkola’s case the effect is often the reverse. In other words, while the humor and outrageousness are ramped up considerably, it’s typically at the cost of the horror. Which is a pity because while the Nazis never needed help in being terrifying, very little of what made them so makes it intact to Tommy Wirkola’s movie. Posted in directors, genre, horror, Movies, Netflix, review.Tagged Dead Snow, George Romero, John Carpenter, Sam Raimi, spider man 3, The Evil Dead, The Evil Dead 2, The Fog, Tommy Wirkola.